When it comes to spending I sweat the small stuff. I’ll never buy a National Lottery ticket, even the £2 minimum, as I know that the probabilities say that I’m more likely to win significantly more by investing it rather than buying the ticket. Even if there is a ‘£20.9M Rollover plus a guaranteed raffle millionaire’ tonight. During the FIRE (financially independent retired early) accrual phase investing that £2 a week turns into nigh on £1,300 after 10 years (assuming a real 4% annualised return). During the drawdown phase not feeding a weekly lottery habit, even a £2 a week one, means one needs £4,160 less (assuming a 2.5% withdrawal rate) wealth before FIRE becomes a possibility. I know how hard I have to work to save £4,160. Unlike many of my colleagues I also don’t pay to participate in a daily morning caffeine fix. I was travelling on the company dime recently and purchased a coffee at one of these new fangled remote Costa stations. Cost £2.10. To feed a workday daily habit like that one is going to be spending £568 per year. Take the free work supplied coffee; invest the money saved and all of a sudden you’re £6,800 closer to FIRE after 10 years. Keep the habit up in FIRE and you’d need additional wealth of £21,840 (less a small amount of wealth to make one at home) before calling oneself FIRE’d. I value earlier FIRE rather than an expensive cup of daily brown but I of course appreciate others might be different as they value it where I don’t. Having different values is after all one thing that makes the world interesting after all. I also sweat the small stuff when it comes to investing expenses. I’ll work to save 0.01%. 0.01% doesn't sound like much but multiply that by my FIRE number and all of a sudden that’s £100 per year which multiplies up to requiring additional wealth of £4,000 before FIRE becomes possible. It takes me weeks to save £4,000 after tax and hours to save to save 0.01%. Sounds like a good time investment to me. That’s big stuff ... and I’m not sweating it at all. At our house, we don't buy lottery tickets either. I do understand people dream about winning. Excellent graph, bringing the volatility to life. I'd never made the connection before, having the ability to focus on the pennies here and there in expenses whilst having the strength to ignore comparatively enormous fluctuations in overall portfolio value. Sometimes it does take a bit of cognitive focus to accept that 0.01% is worth a fair chunk as the numbers get larger and larger. 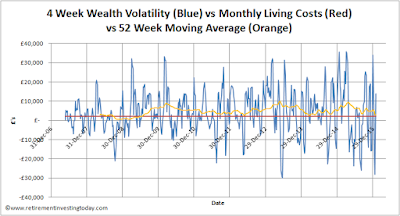 Have always not sweated volatility? Or is it a skill do you think? One that can be trained and strengthened? You always read that you should set your 'bonds' : 'equity' allocation at a point that is compatible with your risk tolerance. I do think there is some training here as you suggest though and that comes from your knowledge about how markets work. As I sit here and type this I for example would not be particularly concerned if 'equities' fell 50% because that's what they can do. I also position my portfolio so that I can take advantage of that because 'I know' it's going to happen again. A newcomer to the investment world would I would guess not think that way. I would imagine going 100% equities is for those in their wealth creation phase, when they've got time on their side to recover from market crashes. 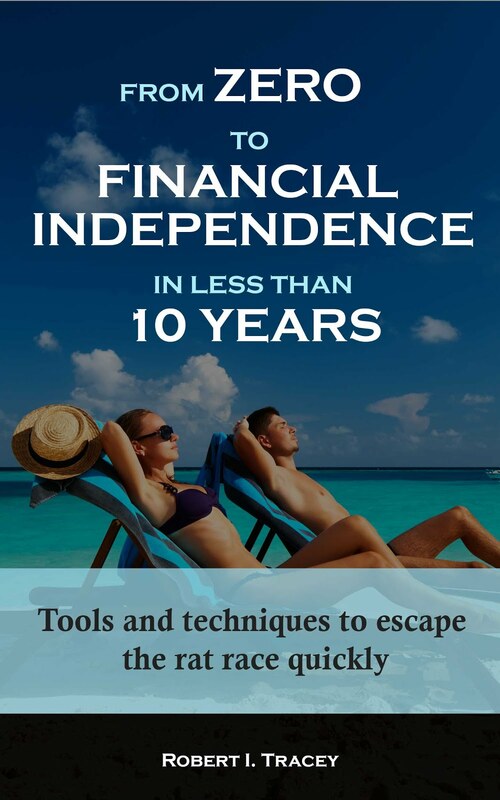 Once you get to your FIRE target amount, you'd be crazy to stay 100% in equities - you've managed to escape at that point, so an aim of wealth creation should instead turn into an aim of wealth preservation, which implies a more conservative asset allocation and a far lower chance of suffering 80% losses. 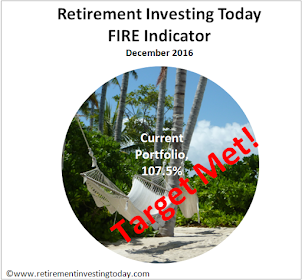 If, having reached your FIRE target you have to chase for yield (i.e. stay overweight in equities) to cover your ongoing expenses then you've probably set your FIRE target amount too low. Victoria Moore, the Tel's wine writer, suddenly announced today that you begin to really notice how much better wine tastes once you spend £15 per bottle. We hardly ever do. On the other hand we drink so little nowadays maybe we could afford to try that policy for a couple of months. After all, we're old enough that every penny that doesn't pay IHT effectively fetches a 40% discount. Maybe we'll start next time one of the supermarkets offers 25% off if you buy 6. It's almost Feb so surely it's time for such offers? Thinks: I wonder if that £15 would be £10 if we went to Aldi? We like most of their other stuff. I can tell you from experience wine is a dangerous thing to get into :) It really does depend on how much you actually enjoy it - it doesnt matter what the price is, do you like it :) If you would always regret paying 15 or 20 for a bottle, then you wont enjoy it regardless! Not drinking is definitely cheaper, but not something I could do! You are assuming that a trial of this policy will only have an impact for the few months that you intend the trial to last. You (and everyone else) should only consider starting this trial if you are financially stable enough and willing to pay £15 for every bottle of wine you buy ever again. The joy of going from £4 to £15 wine is not necessarily the same as the pain of going from a £15 to £4 wine. Your sneaky tastebuds can adapt behind your back in far less than a few months. If your tastebuds change permanently, and your wine budget reduces or returns to the pre-trial level, your options will be to chug down wine you find unpalateable or (excuse the vulgar phrase) drink LESS wine. If you are budgeting for IHT and would prefer to drink that 40% tax rather than give it to George O, good for you. But I would caution the younger and more impressionable readers to think carefully before doing something that could have a lasting impact on their ability to drink and enjoy £4 wine. Switch to beer, as there the price doesn't ramp the same with quality. There are many things where price is not a linear function of quality, the art is to cultivate tastes where quality counts. I'm a fan of smoked salmon offcuts, as I want flavour, not presentation. We similarly sweat the small stuff in our household but are generally comfortable making the discretionary spend if it represents ‘value’ or has a positive expectation (in the long-run). Take your lottery example. I used to play the lottery when the tickets were £1 and the top prize exceeded the probability of winning. This used to be 14m-1 until they changed the structure and upped it to 45m-1. With the cost of tickets now at £2 then I need to see a top prize exceeding £90m before I could be tempted to gamble again so it looks like my lottery days are over. In terms of ‘value’ then we upped our wine price ceiling to £6/bottle from the £4/bottle we used to spend. Over the course of a year we drink around 50 bottle of wines with that extra £100 of expenditure representing good value to us. Having tasted wine in the £10-£20 range I don’t think we would get the same level incremental return from upping our average spend to say £10/bottle. I still don't take the lottery even in those extreme cases as the probability (of course the magnitude is very different but a £5M vs a £90M win would make no difference to me; of course much better for advertising of the lottery though) of the win is still unlikely. Nice example on the wine though. You've made a conscious decision based on value. That's how I think of it also but I just don't do it for wine as I mentioned to dearieme. Please explain : " but a £5M vs a £90M win would make no difference to me "
I don't covet stuff. I covet health, wellbeing and time (in both the good times and the bad) with friends/family. I've done my numbers and think £1M is enough. I know others/yourself challenge me on that and I'm continuing to work on it knowing I have time on my side. If I had £5M I would surely help friends/family more than I currently do/plan to but the risk is that the dynamic would change. Law of unintended consequences and all that. I also know that my current plans would see 'risk of failure' drop to nigh on zero where I know I have some now. Would I buy more or more expensive stuff? I don't think so, or at least I hope not, as it's not what's important to to me. I've spent years opting out of consumerism. The last thing I want to do now is opt back in as opting out has been beneficial from a living perspective as I now focus on what's important. Now I have £90M. What am I going to do differently to £5M. I don't want a Lamborghini, I don't want a 27 bedroom mansion and I certainly don't want friends who are friends because I have £90M. What would I do with all the extra. About the only thing that comes to mind is to help charities that do charitable work (as opposed to line their Exec's pockets). I guess that would make a difference to me but given I don't take the lottery it's not something I have to worry about. You're going to have to help me with your cryptic message stringvest. No House will become a house once I leave the South East of England and FIRE. I'm working on that now and making good progress. Saving £100 (0.01% of £1M) here and there means I don't need £5M let alone £90M to FIRE and be happy. I think the diminishing returns from extra capital, i.e. 5m vs 90m being of little difference is often portrayed with the argument that having one swimming pool is nice, but having 10 swimming pools is no nicer. I think the argument is valid and pretty straightforward to understand, even for someone shivering in a stringvest in an icy january gale - the cold seems to be restricting the ability to type whole sentences? You are spot on with sweating the small stuff - as the saying goes, look after the pennies and the pounds take care of themselves. I keep a careful eye on everything I spend, so I make my own lunch (normally, but can't always), dont buy the coffees etc. and it does make a huge difference. We do occasionally buy a lottery ticket, safe in the knowledge we wont win, but for a bit of entertainment when the prize is high - probably one a quarter at most! As in the comments - what would people do with 90M? I think the prizes are actually too high as it ruins people and they have the wrong type of people keep in touch. I would far prefer it was a chance to win say 100k or 250k but for many more people, but then of course people wouldnt play it! That's what premium bonds are for. I'm glad I'm not alone on the coffee front Rob. Note I'm not for a minute saying don't buy a lottery ticket. What I'm saying is that make sure it gives you value before you spend money on it. You say it gives you entertainment. That's great provided another form of entertainment for the same price per unit of value wouldn't give you more. It gives me no value and so I don't participate. Exactly RIT - I view it as less than half the price of a pint of beer (in london! ), so its a soft bit of a giggle. I did think I ought to just shove it off the mortgage, an extra two quid here or there will help, but so far thats the only ticket in six months so I have the entertainment, as you rightly say! Not sure if you know people from your young years who passed away by now...hopefully not, but I do have 3-4 fellows I studied together who got tumors, heard, stroke, etc. So, I attended my university reunion where I gave a speech that the achievement for all of us to be alive after 20 years... and this is the greatest achievement so far not matter if one is a billionaire or manual labor worker. The point is that every minute you live is gone forever and you cannot re-live it again, so why would you deny some small pleasures(in reasonable degree) such as morning coffee if your portfolio valuation goes up in down in thousands? Allow yourself enjoying small things and work on big goals. Just ensure your small enjoyments are really small! I agree K. In the last few years I have lost family and friends to both illness (some of which I had never heard of previously) through to a freak accident which should have resulted in nothing more than a small bruise. Incredibly sad times for family and friends. I've also lost family to old age so it's all about balance between now and the future. Last year I spent £712 on entertainment and £1,103 on holidays. Hardly deprivation particularly when many of the pleasures in life come for free. I allow myself the small expense of a £2 lottery ticket because what I'm really paying for is the fun and enjoyment I have with friends and colleagues when we dream about what we will do if we ever won the big one! Unlikely that we will ever win but nowt wrong with dreaming! Please don't see it as scary. It's nothing more than Mr Market doing his thing. 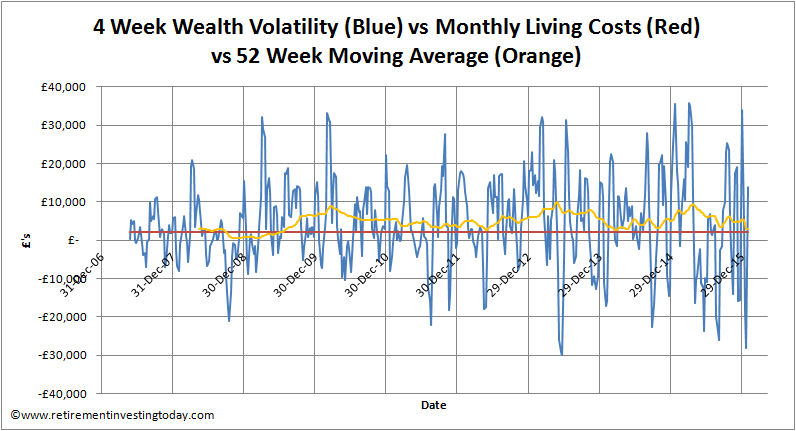 Maybe have a look at the orange line which smooths out the short term gyrations by taking a 52 week moving average. It looks a lot less violent and has been always positive since I started saving hard and investing wisely way back in 2007. Remember that the probability of winning the lottery is effectively the same whether or not you buy a ticket. So just play without one and save yourself the cost and effort. You're going to have to put some more flavour around this if we are to understand stringvest. Good post with a good point. I've been reflecting on this too. I'm buying a London house and have been sweating the stamp duty (~10%) for months. What I've discovered recently is that my (house-sized) portfolio has been swinging by six figure sums in the recent volatility. It is a quality problem but has helped me put the stamp duty in perspective. I am also wincing at the transaction costs I'm paying to liquidate funds. Ten quid, or even fractions of a per cent, doesn't sound too bad when you only transact once in a blue moon but with a lot of sell orders in quick succession I have spent thousands. On broker fees. Grumble. I do think the geo-arbitrage aspect is valid though w.r.t to accomodation costs. Is this the main factor for you? I share a lot about myself on this blog already so to protect the innocent I'll provide a slightly guarded response. It might help if you think of my family and close friends as having really embraced globalisation. Moving somewhere on the Med will therefore be neither a hindrance or a help. Additionally what will actually enable more time with them is the additional unhindered time that will come with FIRE. I agree that only a minimal benefit will likely come from the weather and geo-arbitrage is but one element but it's about a lot more than that. Personality (inc history), safety, culture (inc difficulty of integration and acceptance of 'foreigners'), rule of law, financial stability, isolation, weather, cost of living the life we want, healthcare and tax to name a few. That makes sense - your friends and family are more europe than specifically uk based. do you consider isolation as a positive or negative? and how much does a big-mac cost in Malta? UK is safe, lawful, v. good on healthcare, low tax (for FIRE type incomes) and v. rich in culture, but it isn't hot and dry. I'd probably aggregate personality, culture and history into one metric - and score the UK highly on it. Its difficult to argue that the UK doesn't punch above its weight when considering its cultural and historical impact on the world. - I make my own coffee at work using a plunger and a bodrum milk frother. I get some strange looks but I enjoy the coffee. It only takes a few minutes with my routine. - I make my own quick but very healthy lunches (protein, leaves, carrots, tomatoes, etc). I make smoothies with healthy ingredients. This frees up my personal requirement to always eat healthily, allowing me to make quick meals in the evening and put in more hard work to doing well at my job. - I've cut back on drinking but if we are going for nights out I tend to arrange a meeting beforehand and have wine, beers or cocktails at home first. I then have a drink our two while out to "top up". This probably applies more to people who socialise a lot. Drinking and going out were probably my biggest discretionary spend and this helps a lot. - Mobile phone. Buy and keep a cheaper model of phone that serves my purposes and use the cheapest pay monthly contract that does the same. I spend £15 pm and that's about the sweet spot for me. My phone is 4 years old. - Always looking at price per kg in the supermarket. We eat very well, which means nicely, but we are cost conscious and think save about 50% of what we might have spent. - DIY at home. I fix my own gutters, radiators, drains, etc where possible. Now, as for lotto tickets, I buy one maybe once or twice a year, knowing the odds full well. I only do it because I get an afternoon and a bit of entertainment and dreaming from the £2, instead of spending £20 on a movie and popcorn. "I make my own coffee at work using a plunger": I used to do that. People would come to my office to enjoy the smell. I shoulda charged them. Welcome aboard mwpt. That is an impressive list you have going there. To answer your question from a previous post - "Do you ever consider potential changes to the taxation of pension withdrawals in your choice of destinations, in the future?" I try to but how do you prepare for extreme 'left tail' events? For example complete confiscation of pensions by a bankrupt government. I'll have considerably more wealth than I'll need at the point of FIRE so can carry some damage and still be fine but I couldn't carry full confiscation. The way I think about is that I have to balance this risk with my death bed self who regrets wasting all those extra years that were spent accruing wealth that wasn't required for the desired standard of living. Great post RIT. For me, I'm happy to 'sweat the small stuff' that is time neutral or time positive, but there is a limit to how much I'll think about the small stuff. Not waiting to buy a coffee is easy - quicker and cheaper to make it at home or drink the free coffee from the office. Not spending time, money and fantasy time on the lottery - again easy decision. But using up time and the (limited) power in my brain to decide where I can save £2 on a pack of socks and optimise the quality/wear/cost equation - it's not worth the effort for me. You are spot on about the lottery. What a waste of money that is. I even wrote an article recently called The Lottery Is A Tax On The Stupid. And as you point out, those saving really add up. Enjoyed this post, and the discussions below, greatly. I used to swing between "yes but it's only £2.50 NOW for that coffee", and the idea of hundreds of pounds over the years was too abstract to have an impact. Then one day it dawned on me; it's not about the £2.50. It's about the bigger picture, and a mindset, rather than calculating the cost over 10 years of having a takeaway coffee. An epiphany. A low-rent, caffeine-based one, but don't take it away from me.